New. 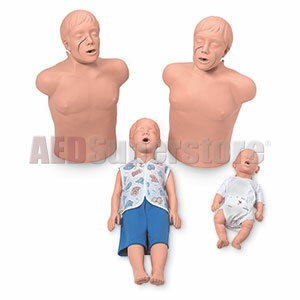 Complete professional package with jaw thrust manikins. This package is intended to give instructors the opportunity to replace older equipment or purchase start-up needs in the most economical way possible. These jaw thrust capable pediatric manikins offer you another option for teaching healthcare professionals. You will find all of the same features of our regular manikin with the addition of this simply rugged construction technique for instructing the procedure for moving the jaw and tongue out of the way without moving the head. Two-rescuer technique allows you to ventilate the patient without lifting the jaw. 2 @ 28" x 18" x 10"
34" x 11" x 7"